Lista di Spagna 116/A, 30121 Venice, Italy. The Boscolo Bellini overlooks the Grand Canal where it joins the charming Via Lista di Spagna with its fashionable boutiques, shops and restaurants, and is not far from the Rialto Bridge and St. Mark's Square. 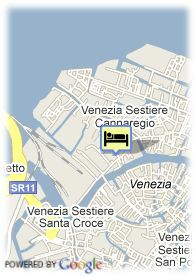 Easy to reach both on foot and using public transport the hotel is in a strategic position just 50 metres from the railway station and close to a vaporetto water-bus stop. 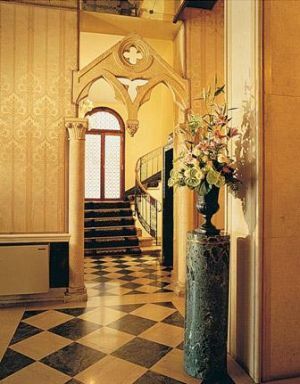 Guests are welcomed to this elegant aristocratic building, which was turned into a hotel at the turn of the last century, by ancient marbles, Murano glass chandeliers and 18th-century Venetian decorations. they will delight in the reserved atmosphere and silence of the 105 rooms which are intimate and exclusive havens of comfort and beauty. The Art Deco widows in the Breakfast Room make mornings special thanks to the soft lights which filters into the room. And the salons and charming little garden complete the picture of this atmospheric old palace which gives any stay a special added value. For older children and adults 55.00 € for each additional bed is charged.